they're from the "Crystal Clear" collection! These acrylic trays are quite classy... and would coordinate well with "Clear Cube" makeup drawers & other similar products. I've actually been seeing these in stores like Wal-Mart, Target, and Ulta for awhile... but I just recently realized my need for some different storage things like this. I wanted to show you how I put these to use in my makeup room... so below are the best pics I could take (it's kind of hard, because it's clear!) And I'm kicking myself because I threw away the packaging-- these all had specific names. They run between $15 and $20 apiece. I've found it's helpful to keep products I'm testing out to review separate from the rest of my collection- that way I don't forget about them. 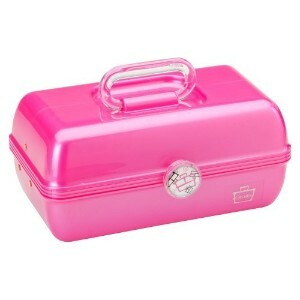 Out of the 3 Caboodles pieces I have, this one has the most divided areas. The back part of the kit has quite a few small compartments... places that could store multiple eyeliners or a lipstick. Some of those compartments are slightly larger and can fit foundations. In the front, there's actually a drawer, and on top of that (where the it cosmetics powder is sitting) is just a flat platform where products can sit. In the lower right, there's a square compartment with a removable lid. I'm storing this in an open space on my desk by my makeup palettes. As I review various products, some will come out of the storage area, and others will go in. The varied sizes of the slots here should cater to any product. It's a much cleaner look than multiple little containers sitting all over my desk holding various things. Makeup comes in about a zillion shapes and sizes. I've found that small palettes- like those from Too Faced, are tough to find a good place for. They're too chunky to fit in the file-folder type things that I use for Coastal Scents palettes... and I feel like I'm constantly moving these things around. This storage tray has more open space than the first one, with about 5 smallish slots, and 3 fairly large open spaces. It holds multiple palettes from Too Faced, Benefit, and tarte.... and I also like that I can put another organizer inside to hold squeeze-tube lip glosses. This tray also has small handles on each side. This easily slides out above some of my other storage drawers in my bookshelf. 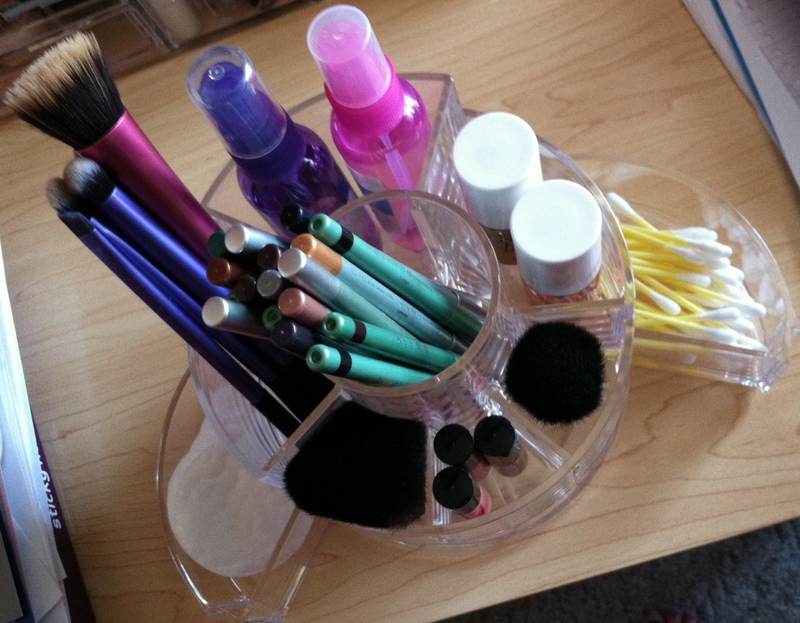 I could see this tray as being a GREAT drawer organizer product and I'm thinking about getting more for my bathroom drawers... it'd be so great for bobbi pins in the smaller areas, and other little hair tools, skincare items, etc. There are some products that have just never had a good place to live in my makeup area. Let's list them... kabuki brushes, Benefit stains, mini brush cleanser & water mist bottles, q-tips & cotton pads, and my abundance of Mally eyeliners. I also recently picked up some Real Techniques brushes (many of you told me I needed to try these!) so I needed some space for those too. What's cool about this round organizer is that the bottom two wings can be pushed in, taking up less space. The smaller slots in front are just PERFECT for those hard to store kabuki brushes! I see this as also being great for your tall products- liners, mascaras, and brushes. While this doesn't spin, I like that it's tiered so from front to back- you can see everything you have. Now all of these products that used to clutter up the area around my makeup mirror sit contained, off to the side. Still very accessible, but much neater. I'm thinking about locking my box of Triscuits up in the kitchen. Must. stop. eating them!! If you need some laughs throughout your day, follow @laughbook on twitter! Watching the most ridiculous Vitamin Water commercial... did that guy just ride an antelope? Been getting back into my workout routine... thank goodness for Tyler who has been serving as my in-home personal trainer a few times a week. I'm grateful for the knowledge he's gained over time and is willing to share with me! Hey Emily - I love these storage iedas! Thanks a million! When you are ready, could you let us know what you think of the Real Techniques brushes? I just bought the stippling brush but, as I don't have an other specialist brushes, I have nothing to compare it's quality too. It is beautifully soft though. I like your storage ideas. I recently bought those drawer organizers that are square and rectangular which you can connect to each other. It is very helpful now when I open my drawer and not hear my make slide back and forth. Oh, and I recently replaced all my brushes with Real Techniques brushes. They are truly awesome!!! I especially love the Expert Face Brush, which I think blends foundation better than a foundation brush. I think that brush should be the new essential in every makeup bag!!! Thank you for this post! I am constantly struggling to properly store many of my homeless makeup items! Fantastic advice. I use the clear ones too. All the compartments are great. 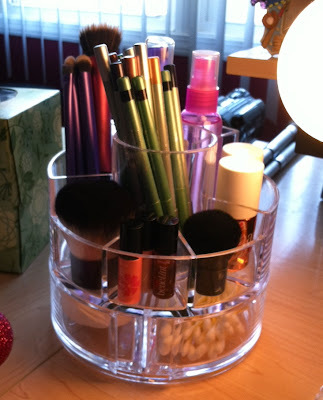 I need that round organizer. I am going to keep an eye for it. Perfect for the vanity. feel like a lot of this can be achieved with simple container store organizers (they even look the same) and they don't come in these sets, so you can just buy a few pieces at a lower cost. i do like that round brush holder with drawers though. I love how you store your makeup. My collection is much smaller but I have started organizing my eyeshadows by colour like you suggested. I am also loving Almay Get Up & Grow...all thanks to you! I actually just posted my opinion on the new tarte primers that are in your products your testing out storage container. I'd love if you would check out my review! Looking forward to your review as well Emily. I love your make-up organisation! Great post, Emily! I always give these a glance at the store but never much thought. I could really use the round one that you have your kabuki brushes in for just that same reason. I'm not enjoying my lazy susan type thing any longer. Thanks again! They are truly awesome, it is very helpful, I like some of your storage ideas. Thank!!! 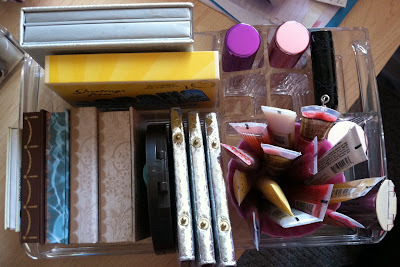 I always love seeing how others organize their many makeup products in their collection! Thanks for sharing!! I love these things! I need to find them!!! I hate storing my makeup in a caboodle which is exactly what I have now! Aw, the Caboodles box kind of reminds me of a much cuter pencil box. great post! i guess im not the only one who has a million little odds n ends that just dont quite slot in anywhere else... the plastic containers really appeal to me cos they're transparent so i wouldnt have to spend half an hour looking for things as they're all on show! I love how you store everything and your organization! For the last round storage unit, if you purchased an inexpensive tabletop lazy Susan, you could have it rotate too. Just a thought. I really want to have that round piece! I've been looking everywhere for it online but can't find it anywhere :( It'd be perfect! Do you know which store that one in particular came from? Does anyone know where to find he round one with the wings? I've not seen these anywhere yet. :( Hopefully they show up in SmallTown Missouri soon!! I have been looking for the circular one everywhere and I can't even find it on their website. Where did you get yours? Can you do a what's in my caboodle video? If anyone is still interested in the round organizer, I found this one on Amazon that looks like the same one.